Sometimes I am a little behind the times. Well, in today’s age, doing something only a couple of months later can be seen as ‘behind the times’. For example, I only recently signed up for Twitter just under two months ago. At least I was on Facebook and had a YouTube account for uploading some videos. But I finally decided to move into the world of Tweeting. So, with a book review being posted only now on Brian McLaren’s A Generous Orthodoxy is, well, way behind the times, since the book was first published in 2004. I’m talking way behind! More and more, Brian McLaren stands as the ever-controversial pastor-author, being at the forefront of the emerging-emergent church movement. I liken Brian McLaren to Marmite for Brits. Marmite is a yeast-extract that Brits (and other nationalities) spread on their toast. But here is the thing about Marmite – they say you either love it or hate it. I have never tried it, only smelled it. And the smell reminded me of a combination between beef jerky and fishfood. I’ll let you guess which side of the fence I sit with this product. And, with regards to the more extreme pendulum views, whether this is good or bad, I think that is typically where most people find themselves with McLaren. Many see his concepts, and other emerging proponents like him, as the best thing since sliced bread. Others see him as a heretic, and I’m sure he has even received some labelling as antichrist (which I will go ahead and say is a bit ridiculous). The subtitle for the book is quite lengthy: Why I am a missional, evangelical, post-protestant, liberal/conservative, mystical/poetic, biblical, charismatic/contemplative, fundamentalist/calvinist, green, incarnational, depressed-yet-hopeful, emergent, unfinished Christian. 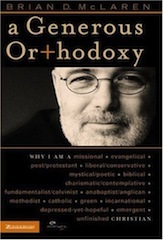 The main thesis of the book is to create just what the title calls for: a generous orthodoxy. His desire is to create a wide enough playing field in his orthodoxy for all to embrace and enjoy. Now, hold on there, before the charges start firing away. He is not inherently saying that ‘nothing matters’ or ‘we are all in regardless’. Some would accuse him of such, but I am not sure that is McLaren’s stance. But he is passionate enough about challenging the more exclusive, dogmatic boxes that can be created for, one, keeping ourselves in and, two, keeping others out. Through his life, at times, McLaren has been drawn into varying expressions of the church, and he considers this a great plus in experiencing the fulness of who Jesus is. Thus, the subtitle of the book shows his desire to allow the different and varying expressions of Christ’s church draw him in to who Jesus really is. And that is what he longs for with the whole church – a more generous orthodoxy that sees the benefits of and respect for those even outside our own circles. But, while he would applaud certain aspects of these differing expressions, he would also be willing to challenge other aspects. I would not say the challenges are raised to pick a fight. Yes, he shares his frustrations at times with some of the over-closedness that he disagrees with in the church. But I think he reserves more stern treatment in his most recent book, A New Kind of Christianity, which I hope to post a review of in the next week or two. Let me first start out by saying what I like about A Generous Orthodoxy. In general, I really did enjoy reading the book. There are some good thoughts, things that must be considered in this day. As Christians, we do love to create our closed, dogmatic boxes and proclaim it as orthodoxy. And, thus, we get to say who is in and who is out. Most of us have moved away from declaring certain non-essential issues as essential for our salvation in Christ. But we still create our in and out groups. All of us do this, including me. Therefore, I see no problem in championing a more generous orthodoxy. Of course, I don’t agree with every statement and nuance of McLaren. But I think we must consider listening to, if not his for some reason, then voices like his. Many will accuse that this kind of ’emerging thinking’ will take us down the slippery slope in which we are all inclusivists and universalists, simply accepting any ol’ thing. I suppose, at times, McLaren would say, ‘No, that’s not what I am looking to do,’ and at other times he would probably claim, ‘Yes, I am ok with that.’ The reason is, again, his desire to stir the overly closed and dogmatic theology in our own expressions of church. It’s quite like when I talk to an extreme Calvinist, I will throw out some things to challenge their view. And when I talk to an extreme Arminian, I will toss some challenges to them as well. But, I must admit that, as I read this text, I felt a peaceful, restful spirit from the pages. Some would claim I’m just opening the door to a false spirit, but I don’t think that true. The words of McLaren do give a sense of wanting to open the door for better collaboration and acceptance of one another across the varying circles of Christ’s body. For some, that is anathema. For some, that is the call of believers. Again, I’m thinking Marmite here. Personally, I do believe it very worthwhile in considering, learning from and receiving from the varying expressions of Christ’s church. Matter of fact, I have come to appreciate some aspects of varying branches that I wasn’t aware of, such as the Anabaptists. McLaren is quite a proponent of Anabaptists, as he grew up in such a church. Even recently, there are some things within the Eastern Orthodox church that I have come to appreciate. And, dare I say it, even understanding the heart behind icons. Uh, oh. There are three things I would challenge McLaren on. The first is that I believe he has taken on too much of a martyr complex. It’s not overwhelming in the book, but he knows many are not going to like what he has to say, so he might say things like, ‘I know people will disagree with me, even call me a deceiver. But I really am looking to stand for what Jesus stands for.’ Something like that. And, of course, I suppose those who love him will rally behind him and say, ‘Ahh, they have no idea what they are talking about when they hurl insults at you, those religious and dogmatic types. They will never change. Jesus will deal with them like he dealt with the money changers in the temple.’ Something like that. I would encourage McLaren to get on with his specific message and not focus so much on the detractors and accusers. Of course, you have to address these things at times. So it’s not out of bounds. But I would simply try and steer clear of embracing much of a martyr complex. The second thing is not so much a challenge, but I at least recognise that I am not in the same place as he is with regards to the question of hell, which he addresses in his chapter on being missional, chapter 5. I am just approaching his chapter in A New Kind of Christianity that looks at the question of the future. I suppose he will go into more detail in that book than in A Generous Orthodoxy. But I wouldn’t be surprised if he avoided some issues. For McLaren, of course it is ok to not build a dogmatic case. It is clear from more recent words that he does not hold to eternal conscious punishment. I am not sure if he is an annihilationist or more inclusivist in a universal reconciliationist view that ultimately, through the work of Christ, all will be reconciled to the Father. There are respectable theologians that hold to all three views. I have typically leaned towards the first, eternal conscious punishment, as my seminary professor of eschatology was of that view, having written two books on the topic. But I am much more open to annihilationism today, and I at least will respect the words of those who are universal reconciliationists. Thus, McLaren is not too worried about defining his view about hell, though he has a view. And maybe it’s to avoid even more accusatory words, which is somewhat understandable. Instead of defining hell, he would say his desire is rather to get on with being a blessing to the world, harking back to the original words of God to Abraham – I will bless those who bless you, and him who dishonors you I will curse, and in you all the families of the earth shall be blessed (Genesis 12:3). Regardless of one’s dogmatism on hell, or their particular view, I am definitely up for getting on with being a blessing and making Christ known to others. I’m not sure about quite a few theological issues, but I am sure that Christ came to bring the kingdom rule of God that sets captives free and reconciles them to the Father. I know I am a lot more defined than Brian McLaren. With theology, I love systematics, that is systematizing theological topics across the Scripture. For example, studying what the whole Scripture has to say about the kingdom of God, or church, or the Holy Spirit, or humankind, etc. This is somewhat the other side of the coin to biblical theology where we would more regularly study the Scriptures book by book, chapter by chapter, verse by verse. Hence, I am quite defined in my theology. And I believe that is why McLaren’s A Generous Orthodoxy serves a purpose for me (and people like me). Thoughts like these are refreshing to one like me who is a bit more ‘heady’ and ‘systematic’. That’s why I enjoy diving into both devotional and fiction books – to get my head out of proper theology at times. The final challenge would be that these words are really only relevant to the church in America and western Europe. Well, at least at this point. Maybe one day these words will be relevant to Africa, India, the Asiatics, Central and South America. But I would rather Christ consummate all things upon His return than await that day, for it might be a little while longer until those peoples deal with much of these issues. But, while I might suggest to a ‘western’ friend or colleague to read McLaren, I would not suggest it to my African or Asian or Hispanic friends. In general, I don’t think it would be too relevant to them. But I think McLaren is more writing to and challenging the American church. In all, Brian McLaren has written this treatise, and has probably been read by multiple millions now, to stir the church to open their hearts and minds to those outside their own circle. Sure, this has been going on for a few decades now, swinging the pendulum away from super-dogmatism and closed-mindedness. But his words come in trying to swing the pendulum even further, as he believes this is important in the post-modern, twenty-first century world. People will continue to label him as heretic or be quite cautious in receiving much of what he says, but such will only strengthen us and him as we face the challenges. Here stands a man that is continually grappling with how to make Jesus relevant to the world he lives in, a world that is more and more extremely varied and eclectic. To my understanding, that was the major launching pad for the emerging-emergent church – how do we reach the upcoming, emerging, post-modern generation. Even if I don’t agree with every belief and practise, I still recognise that as a worthy consideration. One final challenge to readers of this article. I would encourage you to read McLaren, or others like him, before speaking forth and posting your judgments. I have been guilty of this myself with varying theological beliefs and church circles. It’s not good. It’s not Christlike. When we make our judgments from third or fourth-hand information, we will fall short of being faithful in using wisdom and discernment, and even more, I believe we will fall short of being like Jesus. For this, I am challenged. As I said, I will post some of my thoughts about A New Kind of Christianity soon. At least for that book, I will not be too far behind, since it was only released a few months ago. This entry was tagged A Generous Orthodoxy, book review, books, Brian McLaren, emergent church, emerging church. Bookmark the permalink. I’m now the opposite, lol—ecumenism is one of my biggest interests. I like this review. I think it’s important that we read such books, even if they’re controversial, even if we’re likely to disagree with them. I recently heard it said that ‘your best teachers are your critics’ – I don’t think McLaren here is a critic, but I think it’s essential to not limit ourselves to a single point of view. It’s too easy to become polarised by only being exposed to a certain viewpoint on Christianity. I think two things have most influenced my thinking: (1) hermeneutics, and (2) the regula fide’s relationship to bibliology and canon formation. Because everyone is necessarily bound by interpretation, we can never escape interpretation to “objectivity” — even though some interpretations are certainly better than others. So we must be epistemically humble and appreciative of contributions from our brothers and sisters in Christ from many various perspectives on the scriptures (ecumenism). We often draw the dichotomy between “scripture” on the one hand and “tradition” on the other, but I’ve come to see these lines extremely blurred. Christianity didn’t have a closed canon of scripture for many centuries after Jesus came, and correct doctrine was always formed by the “regula fide” — the “rule of faith,” which was Apostolic tradition. It was the “rule of faith” that the “canon” had to measure up against in order to be considered in the “canon.” So tradition is a fruit of scripture, but scripture is also a fruit of tradition. So this gives a much stronger view of the authority of tradition, at the very least in the Patristic era. This appreciation of tradition also leads us to ecumenism. I’m always learning more and hashing out my views more, but this is where I’ve come to at present =). I have indeed read this book and it did not change my opinion of McLaren.